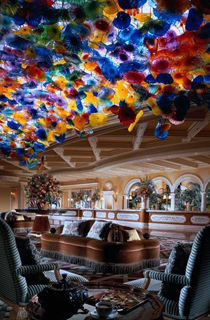 Bellagio’s rooms and suites feature sweeping vistas of the resort's lake, surrounding mountains and Las Vegas skyline. Each is elegantly appointed with custom furnishings, fine art and conveniences such as high-speed Internet access, multiple phone lines, a mini bar and electronic drapes. Decorated in four color schemes ranging from soothing beige, espresso and ice blue to the welcoming palette of russet, sage and wheat, deluxe guest rooms instantly create feelings of warmth and hospitality. Place your bets and get ready for action on the most opulent casino floor in Las Vegas. Whether you are interested in serious or light-hearted play, Bellagio offers an ace array of table games to satisfy. Hands down, the most alluring energy around! Cirque du Soleil weaves an aquatic tapestry of acrobatics, synchronized swimming, surrealism and theatrical romance in the timeless production, “O." “O" was inspired by the concept of infinity and the elegance of water’s pure form. 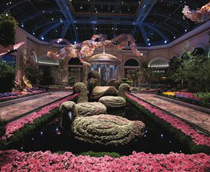 Located just steps away from the spa and hotel lobby, Nature’s majesty is always in full bloom inside Bellagio’s Conservatory & Botanical Gardens. The exhibit, filled with lush plants, vibrant flowers and towering trees, changes five times a year and celebrates each of the four seasons and Chinese New Year. Winding pathways invite guests to experience this visually stunning display at their leisure. The Conservatory is free to the public and open 24 hours. Las Vegas' premier exhibition venue, the Bellagio Gallery of Fine Art presents exhibitions of paintings, sculpture and works on paper by the world's most influential artists. These museum-caliber exhibitions offer visitors a rare opportunity to view legendary works of art carefully selected from prestigious international collections. The Bellagio Gallery of Fine Art is a cultural destination in which visitors of all backgrounds and interests can experience exceptional art in an unrivaled setting. Food lovers can find something to suit every palette inside Bellagio. The only resort with two AAA Five Diamond restaurants under one roof, Bellagio features a total of 19 restaurants offering everything from fresh seafood and delectable steaks to Northern Italian and Asian fare. Food lovers no longer have to go to Paris for the best meals. Several of the finest restaurateurs were invited to bring their chefs and managers along with their invaluable expertise to the Bellagio experience. Picasso – Among one of a select few restaurants to win the AAA Five Diamond Award. Innovative cooking from the South of France and Spain. Le Cirque – Contemporary French restaurant from New York. This AAA Five Diamond restaurant is matched only by the intimate, jewel box setting. MICHAEL MINA Bellagio – Innovative seafood menu. Todd English’s Olives – Mediterranean-bistro. Jean Philippe Patisserie – A French pastry shop unlike anything else in the world. Handmade truffles and chocolate fountains. Shintaro – Modern Japanese cuisine, including sushi and teppan-yaki. Balancing the natural elements of earth, water, fire and wind, the 55,000-square-foot Spa Bellagio’s design is Zen-influenced. The international spa menu features treatments from Egypt, Indonesia, Thailand, India and Bali as well as Native American traditions. 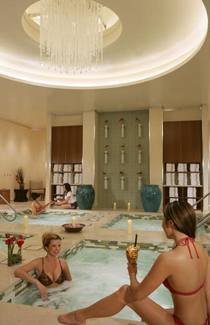 With group “spa-ing” on the rise, several areas within Spa & Salon Bellagio were designed with couples and groups in mind. For men, Salon Bellagio features a private Barber Room with Straight Razor Shaves and Art of Shaving products. 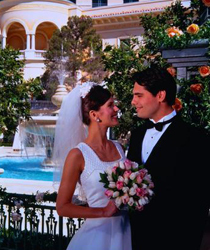 The look of Bellagio's two elegant chapels and its outdoor wedding venue, the Terrazza Di Sogno (Terrace of Dreams), was inspired by European design. The Terrazza overlooks a stunning Tuscan-style landscape and the Fountains of Bellagio, and at the point of the ceremony where the couple has their first kiss, the fountains soar to the sky. From the perfect setting to the perfect flower arrangement, our wedding planners will take care of you – with AAA Five Diamond Award-Winning Style. Facilities include a 45,000-square-foot Grand Ballroom, a 30,000-square-foot Tower Ballroom, an 22,000 square-foot Bellagio Ballroom and 25 meeting rooms ranging in size from 1,000 to 10,000 square feet. 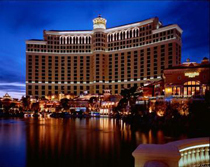 Book Online for Best Bellagio Rates!